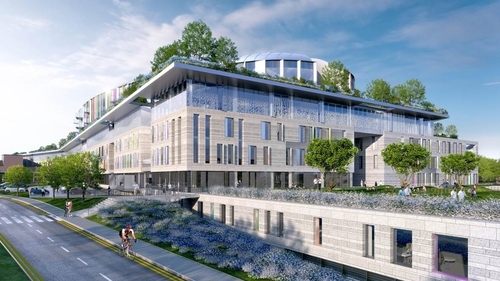 The revised terms of reference of the review by consultants PwC into cost overruns for the building of the National Children's Hospital have been published. The review is seeking to find out what was known, when and by whom about the escalating costs that could top €1.5 billion. The terms state that the review will deal with the accountability of the relevant key parties responsible for the financial control of the project. However, while it will look at individuals' roles, the review will not name people directly. It will assess the decision-making and oversight around the planning and delivery of the hospital. It will also look how the contract was managed particularly in relation to cost increases. The examination wants to establish the underlying root causes and decisions that have contributed to cost increases. The review, which is set to be completed by 29 March, will seek to identify any potential cost savings. Minister for Health Simon Harris also announced this evening his intention to appoint Fred Barry as chairperson of the National Paediatric Hospital Development Board. Mr Barry is a former chief executive of the National Roads Authority. He succeeds Tom Costello, who stepped down at the weekend following the controversy over the spiralling costs of the project. Last September, the National Paediatric Hospital Development Board sought three more months to conclude negotiations with a view to reducing the rising building costs. This was revealed in a statement issued by the Department of Health tonight. The department said this process was not concluded at the time of Budget discussions and the final position did not become available to the Health Minister until 9 November. The cost escalation was highlighted to the Taoiseach at a meeting in the Department of Health on 9 November, which included officials from the Department of Public Expenditure and Reform. The Minister for Public Expenditure and Reform Paschal Donohoe has acknowledged that it would have been helpful if he had been made aware of the developing cost overrun at the hospital sooner. However, Mr Donohoe said that Mr Harris was doing what he should have been doing between August and November, which was to understand the scale of the issue and be in a position to fully brief the Government. "If Minister Harris had come to me earlier on the matter, the first thing I would have asked him to do is quantify it. This is what he was doing. The actions he was undertaking, I would have asked him to do", he told the Oireachtas Finance Committee. Fianna Fáil TD Michael McGrath put it to Mr Donohoe that while the minister did not want to put a colleague "under a bus", he had been left in the dark. Minister Donohoe said he had a lot of engagement with the Minister for Health on a lot of matters, including capital projects and level of capital expenditure and resources available to the Department of Health at any point in time. "When he alerted me we did huge amount of work in a four to six-week period to deal with it," he said. Regarding the presence on the board of the National Children's Hospital of an official from the Department of Public Expenditure and Reform, Minister Donohoe said Paul Quinn felt his responsibilities were "discharged fully". He described the Government's chief procurement officer as a superb professional regarding procurement policy. The chairperson of the Committee John McGuinness questioned how an official from the Department of Public Expenditure and Reform did not see the budgetary consequences of "what was going on". Minister Donohoe said the engagement was between National Children's Hospital Board (of which Mr Quinn was a member), the HSE and Department of Health. Asked by Sinn Féin TD Pearse Doherty if Mr Donohoe was surprised that he had not been informed of the issue through his direct engagement with the Minister for Health, Minister Donohoe reiterated that if Mr Harris had raised the issue with him at an earlier point, he would have asked him to "go do what he was doing". He added that at all points in the process, Minister Harris was doing his best with a challenging complex project. Mr Doherty suggested that if it were Minister Shane Ross, it would be a different story. Mr Donohoe insisted that regardless of the colleague, his attitude would be the same. Earlier in the Dáil, Opposition parties demanded Ministers Donohoe and Harris give statements on what they knew about the cost overrun and when they were informed. Fianna Fáil TD Barry Cowen said it was "hard to believe and hard to credit" that Mr Donohoe could have appointed an official to the board of the hospital and then not "have any idea about the cost overruns" until November last year. He said it "lacks any credibility" because officials on boards "have a responsibility to the minister who's appointed by the Dáil". Mr Cowen said it seemed "highly unlikely" that the minister could not have known more. Labour leader Brendan Howlin said it "beggars belief" that the Minister for Health did not inform the Minister for Finance about the overrun when he "knew it was going off the rails from August". Labour health spokesman Alan Kelly said: "It's a matter now for Paschal Donohoe and Simon Harris to come out now and line-up chronologically who knew what, when, in their departments and who did what." Sinn Féin's health spokeswoman Louise O'Reilly said: "We are looking for political accountability. How we will get that is by the ministers in the Dáil answering those questions. That needs to be our first port of call." The Taoiseach defended Mr Harris, insisting the minister had acted appropriately after being told the overruns, by seeking full information around the escalating costs before presenting it to Government. He said that he responded with "disbelief" when he first learned of the rising costs, and that all avenues such as reducing the specification, or retendering were explored. Mr Varadkar also defended the handling of the project, insisting the Government "will deliver this project". He said the project was an "enormous asset" that children needed, and he was "very disturbed" to hear some elements of the opposition say it should be delayed. Mr Varadkar said that corporate governance rules are that if someone is on a board, their fiduciary responsibility is to that board and "the correct line of accountability is from the chairman of the board to the line minister, not individual board members acting on their own part".